Chris Livingston has been busy as usual, playing medieval city-builder Foundation, an Early Access fighting game called Dust-Up that is basically Mortal QWOPbat, and Snow. Also in Early Access, it's a skiing game that has something almost as scary as the yeti from SkiFree in it—the nightmare people who populate its crowds. 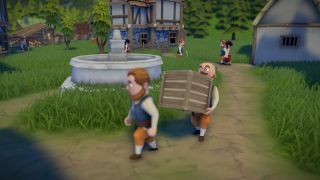 Tom Senior has been playing Driftland: The Magic Revival, a fantasy strategy game set on a series of floating islands. He says, "The building is fun, but my favourite part is the way you can manipulate the islands before you even venture into the structures menu. If you spot an island that's too far away for your bridges to reach, you can cast a magic spell and reposition the island so it's next to your territory." I'm sold. James Davenport's latest Fortnite misadventure involves a Weezer-themed island that plays three of their new songs on repeat. I went to see Weezer once because they did a nostalgia tour where they played the Blue Album front to back and I was young enough in the 1990s to love it, but even I would not want to be subjected to that. Joe Donnelly's latest GTA V roleplay server misadventure sounds more entertaining, because he became some kind of pharmaceutical angel providing illegal highs to the injured while they waited for the official paramedics to show up. As one of those people who finished the singleplayer but bounced right off GTA Online I'm glad Joe's keeping us up to date on the wackiness that goes on there. I've been playing in-depth spaceship sim Objects in Space and some Ape Out, but also found time to try Warhammer: Age of Sigmar—Champions. I like Age of Sigmar's over-the-top take on heroic fantasy, but as a digital card game it's pretty plain. The way each card rotates to a different effect each turn before being discarded once it's completed a spin is interesting, but it lacks the videogame flash of something like Gwent or even Hearthstone. It's first and foremost an accessory to the tabletop game and even lets you scan cards you own and add them to your digital deck. If I played the physical version I'd be happy with this as a free bonus, but since I don't I'll probably wait for an Age of Sigmar RPG or turn-based tactics game instead. Enough about us. What about you, dear readers? Have you been escaping from captivity in Ape Out, or squadding up in Apex Legends? Testing out the stranger variety of Resident Evil 2 mods, or downloading Oikospiel while it's free? Let us know!